Redditch sits in the Heart of England close by some of the most attractive countryside in Britain, yet close by major heritage sites and centres for the arts. Within 25 miles of Redditch (30-40 minutes drive), you will find the cream of Central England, beautiful countryside, historic houses, important centres for the arts and major industrial revolution sites. North of Redditch takes you as far as the historic town of Lichfield, with its 12th Century 3 spired cathedral and includes the whole of the major conurbation of Birmingham and the Black Country. Birmingham, the second largest city in the country, is today a major national international commercial centre, but, during the industrial revolution was at the forefront of the Industrial Revolution which saw the town named as "the first manufacturing town in the world". Directly South from Redditch within our 25 mile limit is the the popular Cotswolds region which is the country's largest officially designated 'Area of Outstanding Natural Beauty' . The northern edge includes the beautiful ancient village of Broadway, known as the 'Jewel of the Cotswolds' and above the village is Broadway Tower, a folly built in 1799 and one of the best viewpoints in the Cotswalds. Among the many famous gardens is Hidcote Manor, one of the National Trusts most visited sites. Immediately to the East, is the attractive medieval town of Henley-in-Arden, with its half-timbered Elizabethan building and Heritage Centre . Just south of Henley-in-Arden is the attractive village of Wooten Wawen. Driving further east, still only a short distance, is Warwick, the County Town of Warwickshire. Here there is St John's House Museum and, close by the historic Warwick Castle . 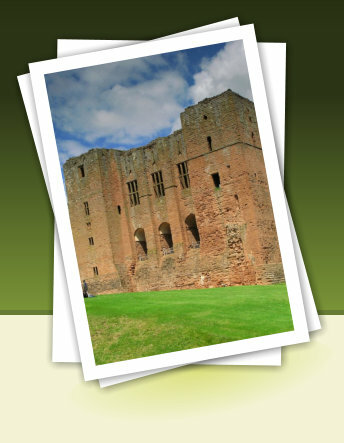 Just to the north of Warwick is Kenilworth Castle the famous home of Robert Dudley, the great love of Queen Elizabeth I, and the Elizabethan garden has recently been restored. Adjoining Warwick is Leamington Spa with the famous Jephson Gardens created in 1831.